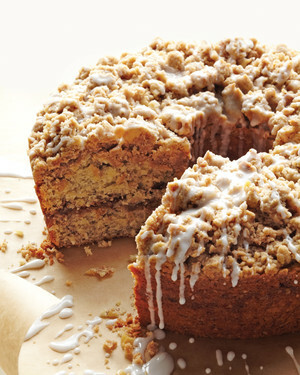 Everyone needs a delicious coffee cake recipe in their repertoire, and this cinnamon streusel coffee cake recipe is the perfect option. Meaning "something strewn" in Old German, streusel is easy to throw together -- and then to throw on top of this sour-cream coffee cake. The sweet glaze in the recipe is the perfect coffee cake topping. Make the glaze: Mix together confectioners' sugar and milk. Drizzle over cake, and let drip down sides. Let set for 5 minutes before serving. 0 Response to "Cinnamon Streusel Coffee Cake"